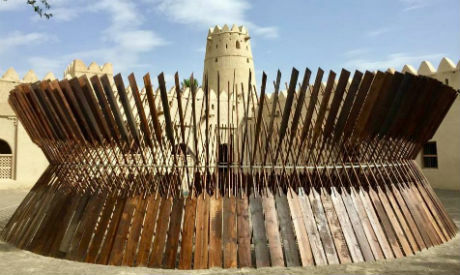 Egyptian award-winning painter, sculptor, and cultural activist Moataz Nasreldin (also known as Moataz Nasr) exhibited his large installation titled Sun Boat at the Abu Dhabi Art Fair, a large international event which took place this year between 14 and 17 November. Having themes of migration and the circle of life in mind, Nasredin's piece is structured from over 300 bread baking panels to form a boat that on the one hand reminds us of the endless migration of human kind and on the other hand references Egypt's ancient history and civilisation. The piece is approximately 10 metres in diameter and 3.5 metres in height. In the notes about the installation Nasreldin writes: "From the beginning of time, the idea of immigration in this world has been a constant pursuit in life. Human beings are constantly moving... north to south, south to north, up and down and then up again. The purpose of this circle of endless, restless motion has always been the same, seeking sustenance, seeking survival, seeking a better life." "Sun Boat is inspired by mankind’s constant state of motion, an infinite circle. It visually depicts the idea that nothing lasts, everything is endlessly changing, always for the purpose of survival." He adds that the concept of immigration has existed from the most ancient of times. The Ancient Egyptians migrated from this life to the eternal one using Sun Boats with large paddles. "In this work, I visualise the essence of this human motion using bread baking peels, which are coincidentally, almost identical to boat paddles. With these peels, I created a sun disc of 350 paddles tied to each other in a circular shape illustrating the endless, interconnected movement of human beings on earth seeking a better life." One of the well-established and most active Egyptian artists with a large portfolio of international appearances, Nasredin is also the founder and director of Cairo's Darb 1718 cultural centre, a space consisting of several rooms in a number of buildings, infusing the area with arts and culture. Since its founding, Darb 1718 has established itself as one of the most important venues embracing Egypt’s independent arts scene, organising visual art exhibitions, as well as film screenings, music concerts, and educational events. Darb 1718 currently holds the large-scale event Something Else -- Off Biennale (1 November - 15 December) with visual art as its basis. Curator Simon Njami worked with several international supporting curators as well as Nasreldin (the Biennale's artistic director), filling the halls of Darb and other venues located in Downtown Cairo with the work of 90 artists (including 23 Egyptians) from all over the world. Held this year between 14 and 17 November, "Abu Dhabi Art expands beyond the notion of a traditional art fair in placing strong emphasis on a diverse public engagement programme, including art installations and exhibitions, talks and events that take place in different locations throughout the year," reads the Fair's website. "The culmination of this year-long programme is the Abu Dhabi Art event in November, which provides an important sales platform for participating galleries while also offering these galleries an opportunity to showcase ambitious installations and site-specific works by their artists to an audience of over 20,000 visitors."